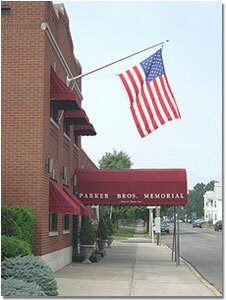 Our Story - Parker Bros. Memorial Funeral Home Inc.
Parker Bros. Memorial was founded in Watervliet on March 10, 1881 by brothers William F. and Joseph Parker. Originally established to serve a hard-working community of diverse immigrants, who came to this area seeking work along the banks of the Erie Canal, the funeral home quickly earned a reputation for caring service. The original funeral home was housed in a former, Town of Watervliet, courthouse at 2107 Broadway. In an era when most wakes and funerals were held from private homes, the funeral home building served as the Parker’s offices and as a place for families to select a casket. The building was also known as a place for the Parkers and other gentlemen of the day to congregate, smoke cigars and discuss politics and other issues. Following the death of Joseph Parker in 1891, William F. Parker, solely, operated the funeral home until his four sons entered the family business. Charles E., John E., William F. and Joseph J. Parker were all, at one time or another, involved in the operation of the funeral home with their father. On March 9, 1934, our founder, William F. Parker died following a one-month illness and in that same year cancer claimed the life of his son John. In the years prior to his death, William and his youngest son Joseph realized the need for a larger and more modern facility and plans were made to construct a new funeral home at 2013 Broadway. The new building, completed in 1934, was truly a state-of-the-art facility. Saddened that his father did not live to see it’s completion, Joseph renamed the business Parker Bros. Memorial Funeral Home, in tribute to his father and uncle. The occurrence of funerals taking place in private homes and apartments began to wane in the years following World War II. Joseph J. Parker recognized this trend and in 1957, constructed our large, "North Parlor". One year later he built our south addition, which housed a new and larger casket selection room. It was also at this time that he added automobile parking areas, as more and more people were acquiring automobiles and becoming less dependent on public transportation. 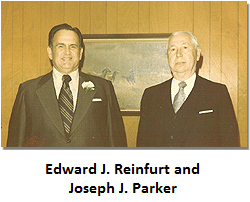 Joseph J. Parker obtained sole ownership of the funeral home from his brothers and in 1950, Edward J. Reinfurt joined him to assist with the operation of the funeral home. Over the years, as the numbers of families served continued to grow, additional help was needed and Daniel R. Reinfurt and John F. Tallman joined the funeral home as funeral directors. 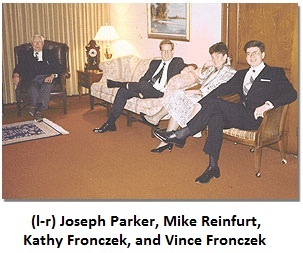 In 1974, Mr. Reinfurt assumed ownership of the funeral home and Mr. Parker remained as a consultant, residing in his apartment above the funeral home, until his death in 1990. Mr. Reinfurt died in 1982 and his daughter and son, Kathryn M. and Michael P. Reinfurt assumed the operation of the funeral home. 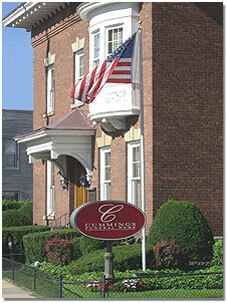 In 1992, Parker Bros. Memorial Funeral Home acquired the Cummings Funeral Home located in the Port Schuyler section of Watervliet. 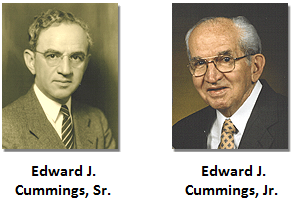 This long-standing and respected business, owned by Edward J. Cummings, Jr., was founded in 1917 by his father, Edward J. Cummings, Sr. The original funeral home was comprised of two buildings, one being a storefront office and embalming room located at the corner of 23rd Street and 6th Avenue and the other building serving as a viewing room and a casket selection room located just two doors west of the office on 23rd Street. In 1922, Mr. Cummings purchased the present funeral home at 643 Third Avenue in Port Schuyler. It was formerly the office and home of Doctor John Deveny and his family. Mr. Cummings died tragically in a car accident on December 23, 1946 in Oakwood Cemetery in Troy while conducting a funeral. His son, Edward J. Cummings, Jr. who was, at the time, attending Simmons School of Embalming in Syracuse, returned home to operate the funeral home. Ed Cummings was licensed as a undertaker in 1947 and remained active in the funeral business until his death on March 26, 2003. In 1995, the Hall & Higgins Funeral Home in Stephentown, NY and the Thomas M. Barber Funeral Home in Petersburgh, NY were acquired. On July 1, 2007, we took ownership of the Bowen Funeral Home, a long-standing and well respected funeral firm, owned by Mr. Arthur E. Bowen, with locations in both Latham and Watervliet. Following an extensive two year renovation, the Latham facility, at Old Loudon Road, continues to provide the wonderful tradition of fine service in a beautiful setting to the residents of Latham, Loudonville, Watervliet and the surrounding communities under the new name of Bowen & Parker Bros. Funeral Home. Sadly, on February 19, 2004, cancer took the life of Kathy Fronczek. A dedicated wife, mother, sister and friend, we will forever miss her dedication, infectious smile, generous spirit and the friendship she shared with the communities she served. Today, the funeral homes are owned and operated by Kathy’s brother Michael Reinfurt and her husband Vincent Fronczek. Assisting them in the operation of the funeral homes are Amy Younger and Michael V. Melvin along with a group of dedicated part-time associates. Arthur E. Bowen serves as our senior director and is always available to assist as needed. With over 134 years of continuous service, all of our funeral homes maintain the same high standards today as we did back in 1881 and those same basic beliefs, upon which we were founded, are maintained as our guide today. As we proudly look back over our past, we also look to the future, always seeking new ways to better serve those who request our service.